Kudos to The Athletic’s Anthony Slater for inspecting a deeply unholy NBA rite closely enough to spot something wonderful. 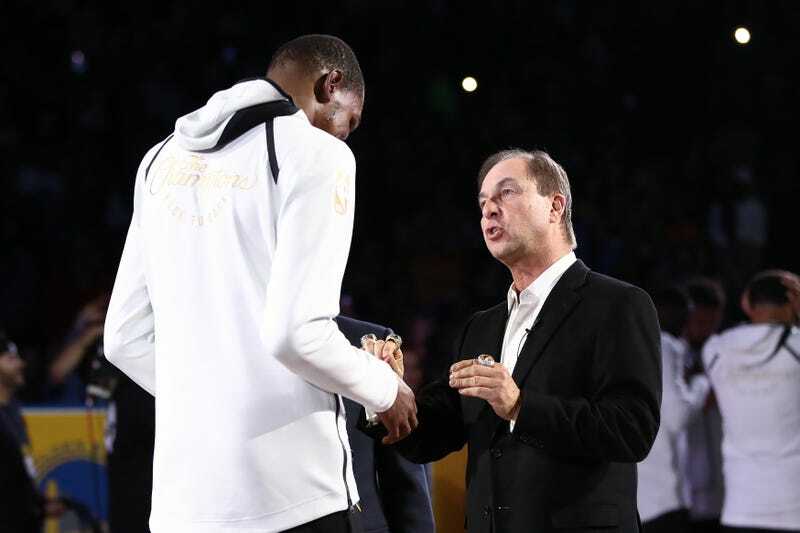 Had you watched the Warriors ring presentation as carefully as The Athletic’s Anthony Slater, you would’ve seen Kevin Durant walk over to Warriors owner Joe Lacob, only for the team’s head trophy-shtupper in charge to mime the signing of a contract, adding the question “Sign?” for good measure. The Finals MVP responded with a covered-mouth giggle before taking his hardware. There’s no disrupting good ol’-fashioned groveling. The DurantWatch marches on! Kevin Durant Bemoans Basketball Media&apos;s "Pure Hate For Me Obviously"